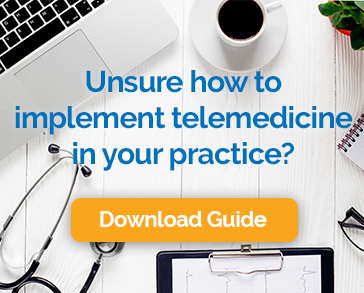 If you are tasked with making the case for implementing a telemedicine program for your practice, or if your just curious why the approach is becoming so popular, you’ve come to the right place. We’ve put together a list of the biggest advantages of telemedicine for providers and patients. A provider can see more patients in less time using telemedicine, creating the opportunity to earn more without working additional hours or adding staff. Telemedicine makes it easier for patients to follow through with the provider’s orders for follow-up visits, lifestyle coaching, medication management and more. Since video visits can be done anywhere, anytime, practices have the choice to extend office hours during the week or even add weekend appointments. Giving patients (AKA – customers) the option of telemedicine is an effective way to protect against competition from retail clinics, urgent care centers, and online-only telehealth services. Providers who leverage video visits can work from home part-time. They can travel, knowing that they are still accessible if needed, and they can set their own hours. Most payers do not reimburse for telephone follow-up calls to review test results or answer patient questions. However, in many cases, if these same encounters are conducted via video, the provider can receive payment. Telemedicine takes some of the pressure off of medical office staffs by reducing the number of patients in the office, creating a less stressful environment, and reducing the administrative burden. Telemedicine eliminates many of the factors, like transportation problems, work obligations, and childcare issues that cause people to cancel at the last minute or to miss appointments. Telemedicine eliminates the need to waste time sitting in traffic. And patients don’t have to pay for parking, public transportation, or gas. Since a video visit can be done from anywhere, there’s no need to take time off of work. Patients can schedule appointments during a break or before or after work. In-office visits are challenging for people with child or elder care responsibilities. With telemedicine, it is easy to get the care patients need without finding someone else to fill in. The best specialist to treat a particular condition isn’t always in the neighborhood. Telehealth enables patients to get the best specialist, even if they aren’t the closest. Video visits eliminate the risk of catching a new illness from someone else in the doctor’s waiting room and of transmitting pathogens to others. “I love sitting in a waiting room,” said no one. Ever. Telemedicine makes it easier for patients to see their doctor when they need to. Follow-ups are hassle free and patients get the care they need to feel better. It is no wonder that healthcare providers and patients alike are embracing telemedicine. The upside for everyone is considerable. Video visits are efficient and effective, easy on patients, and great for medical practices.